'Find the ultimate saviour of life' - Not a bad mission statement for a good ol' recruitment drive, unless you've got no candidate criteria, and over 6 billion possible candidates. 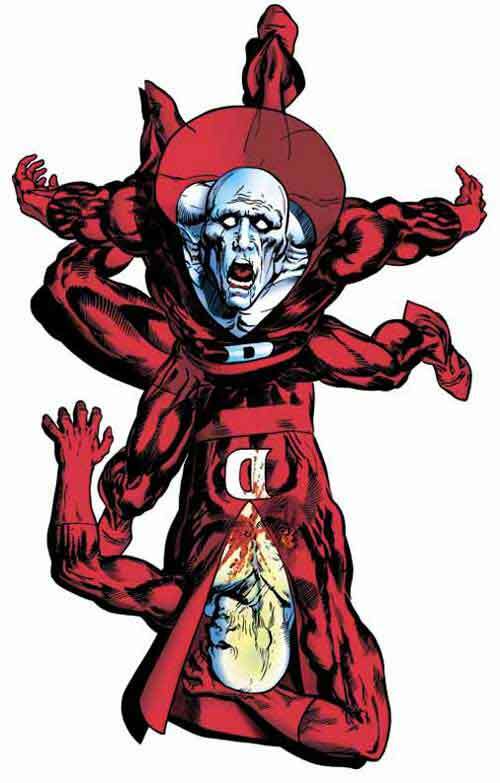 Welcome to the world of Deadman - and this issue is all his (Well his, Batman and Dove's, but who's sweatin' the details)? Me I love a good homage, and this here nod of the head by Ivan Reis and Joe Prado, to Neal Adams' legendary run on the character (and one of it's most iconic images (left)), made it an easy choice for this fortnight's spoiler-free Brightest Day panel. Awesome double-page spreads aside, if I was a betting man I'd say this ends the spotlight issues on individual characters, and now passed the halfway mark it will be more a case of 'look 'Ma no hands' as the speed picks up, racing to series end. Get the down-low on Boston Brand and the girl he lands one on at the end of the issue, by grabbing your copy of Brightest Day #14 now.